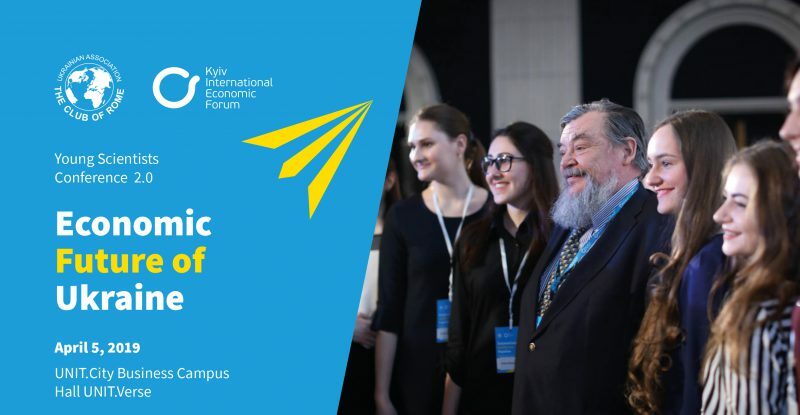 Ukrainian Association for the Club of Rome and Kyiv International Economic Forum are co-organizing Young Scientists Conference 2.0 “ECONOMIC FUTURE OF UKRAINE” in Kyiv, Ukraine on April 5, 2019. Participation in the Conference is FREE OF CHARGE for students and professors. Participants will be invited by results of a competition-based selection. Our mission is to help young talents to become architects of a better social and economic reality and to give valuable guidelines to budding scientists uniting their energy around the ideas of sustainable and socially oriented economic growth advocated by the Club of Rome. Overall YSC 2.0 will bring together around 400 economics students, professors, and talented researchers from TOP universities around the country in the newly constructed innovative conference campus Unit.Verse on the territory of the first ever industrial park in Ukraine Unit.City. The Conference subjects will focus around global economic trends and challenges of 2019, place of Ukraine on the economic map of the world, state economic policy and success stories of Ukrainian business. Keynote speakers will include international and Ukrainian economists, scientists, manufacturers and entrepreneurs as well as representatives of the Ukrainian Parliament. This year YSC 2.0 participants will be able to listen to the co-author of the 50th year anniversary report to the Club of Rome “Come On!” Ernst von Weizsäcker who has being holding the position of Co-President for the Club of Rome for long years. UARC is also honored to host a renowned Norwegian economist prof. Erik S. Reinert, founder of “Another Canon” and author of “How Rich Countries Got Rich…and Why Poor Countries Stay Poor” translated into 20 languages and ranking TOP-50 most influential books on economics of the last 100 years. Participants of YSC 2.0 are also invited to take part in Q&A session, addressing their questions to the speakers, as well as in the new contest of economic articles from the Ukrainian Association for the Club of Rome. The top of the evening will be a guided tour around UNIT.City with a visit to one of the world’s best education IT centers, UNIT.Factory.